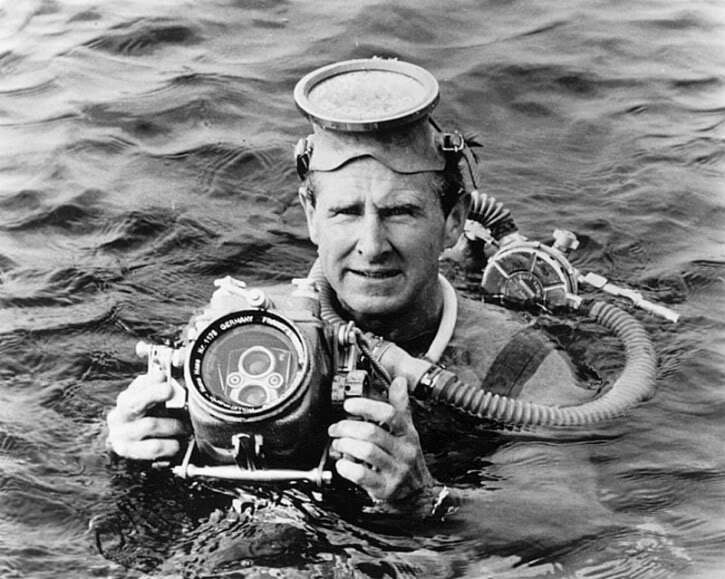 Mike Nelson (played by Lloyd Bridges) in Sea Hunt. The quintessential dive show in the 1960s. Becoming a marine biologist is hard work. It takes dedication, perseverance, intellect and inspiration. Growing up in the 1960s I regularly watched some classic TV shows that were the source of that early inspiration and helped compel me to pursue a career as a marine biologist. If you were conscious in the 1960s and 1970s then you likely remember these shows in their original showings or as reruns. If not, you missed out but most of them are online for free so check them out. Here are my top 5 shows, in no particular order, with their original theme songs and credits. The show that inspired a legion of Scuba divers, Sea Hunt was the first TV series that featured diving as the main theme. Who can forget Mike Nelson (Lloyd Bridges) as a the ex-Navy Frog, freelance SCUBA diver and underwater crime fighter flying over the water in his boat the Argonaut? Nelson solved murder mysteries, did undercover work, fought drug smugglers, counterfeiters, found lost treasure, rescued friends, lived in the “ScubaSphere” and even trained three female astronauts in underwater diving. His long-winded voice overs were legendary as were his solo dive trips (no dive buddies here! ), the frequent dropping of weight belts, running out of air, and walking around with fins, wetsuit and his ever-present mask. My personal favorites were his dive entries off southern California that would suddenly morph into a tropical underwater paradise (filmed in Florida, the Bahamas and many other locations including a tank at the Marineland of the Pacific) and the unforgettable cutting of the air hose in underwater fight scenes. Despite the lack of realism it was an excellent show, very popular on television, and was the country’s most successful first-run syndicated TV show at that time (see Scuba Guy’s Sea Hunt Trivia Guide, below). This show almost single-handedly made me want to become a Scuba diver — which I did when I turned 20. My favorite Saturday morning TV show. Johnny Quest featured an 11-year old boy, his friend Hadji and his dog Bandit who accompanies his father (Dr. Benton Quest — a government scientific “genius”) on amazing adventures all over the world with Roger T. “Race” Bannon as a special agent, bodyguard, and pilot. In many ways this show was revolutionary both in the degree of technology featured in the film, its unusual animation style, and its rich musical scores (see intro theme below). Johnny and his team studied scientific mysteries, which were usually the work of bad guys, and included robots, monsters, mummies and even dinosaurs. My favorite scenes were the underwater episodes where Johnny, Hadji (his adopted brother) and even his dog Bandit donned Scuba gear to explore the mysteries of the deep. I loved the way they solved mysteries with science, the technology, and the adventures which paralleled one of my favorite book series at that time, Tom Swift. One of my favorite and most watched after school shows. I guess the “three hour tour” and “uncharted Isle” in the unforgettable theme song sucked me in but I loved the tropical settings, the expansive lagoon lifestyle in paradise, and the continual hope of being rescued and returning to society. The show revolved around surviving on an isolated island, which involved fantastic inventions, the arrival and departure of various visitors and items, and the impact of news from their radio which had clear communication to Hawaii (where exactly were they?). Although the show wasn’t about the ocean per se I loved the cast, the comedy and the happenings on the island. The show actually generated numerous calls to the Coast Guard who demanded they rescue the poor people! Interestingly, the opening shot of the island in the introductory sequence shows Coconut island in Kāneʻohe Bay — the home of the Hawai’i Institute of Marine Biology. Looking back who would have guessed that I’d end up as the professor and married to Mary Ann! The ultimate submarine show. The tv series featured the futuristic nuclear submarine Seaview with Admiral Nelson (Richard Basehart) as the scientific genius who invented the sub and Captain Lee Crane (Dave Hedison) as the sub commander. The show brought the undersea world of submarines to television as well as the drama associated with the cold war, fighting giant sea creatures, aliens, nuclear bombs, and a myriad of ocean adventures. There is even an episode where they travel inside a whale! I loved the expansive 8-window “shark-like” bow viewport, the flying sub, and the two-man mini-submarine. At the time it was the most popular science fiction TV show of the 1960s and led to other popular shows such as Lost in Space, The Time Tunnel, and The Land of the Giants. The “future” in the series was set in the 1970s and 80s where apparently submarines like that could dive into the Marianas trench (at > 30,000 foot depths impossible for most all submarines today). The submarine was an underwater research vessel based at the Nelson Institute of Marine Research in Santa Barbara, California, and run by the Bureau of Marine Exploration (not the Navy despite the uniforms in the series and the presence of nuclear missiles onboard). I loved the technology and the exploration, but most of all I loved the submarines. When I first got a chance to dive in a submarine in 1988 it was adventure and since then I’ve dove to the “deep” sea over 50 times — an amazing experience (see this post). This show was largely the inspiration for wanting to ride in a submersible. This list would not be complete without the classic TV show of Jacques Cousteau who inspired a generation of marine biologists with his crew on the RV Calypso. Besides co-inventing the “aqualung” (Scuba gear) with Émile Gagnan, his photography and film-making brought the undersea world into the global culture in the 1960s and 1970s. His conservation ethic combined with his gripping films enlightened the public by exposing the destruction of the oceans beginning with nuclear testing in 1960. He created a new genre for marine scientists with his poetic dialog, red caps, speedos, and elegant description of marine creatures: their lifestyle, ecology, and threats from mankind. It’s easy to underestimate how pervasive his influence was for marine biologists, but for me it was unique and huge. My blogs post, videos and scientific research are a tribute to his influence — a giant among men. Of course there are many other shows besides these. So what inspired you? Was it these, why or why not? Does anyone remember Flipper? And for films I expect you’d want to include The Silent World? A classic and important film for sure. Tanks for the memories. Cousteau got me into fresh water, too, but I still run back to the sea. Cousteau is the reason that I went into the aquatic sciences, and sea-sickness is the reason that I stick to freshwater!